It’s coming to the end of harvest time but everywhere you look there are gluts of produce to be turned into something delicious. Some to be eaten now, some to be saved for the winter months. Gardens and hedgerows are filled with bounty and will continue to provide opportunities to harvest interesting things until late October. 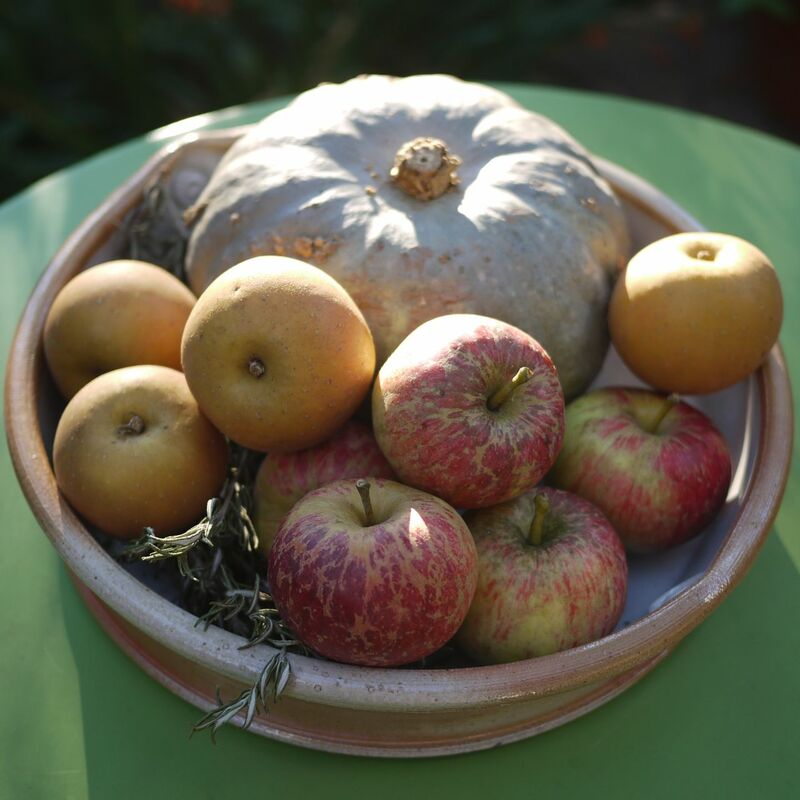 You might have your own fruit trees providing you with an abundance of apples, pears, plums or damsons, too many beans, courgettes or unripe tomatoes. Maybe a neighbour has a surfeit they need to share. There’s sure to be produce by peoples gates either for free or very cheap. And of course you can go foraging in country lanes, in parks and open spaces, on moorland. Whatever you find there’s plenty of ways to put it to good use: cakes, crumbles, pies and tarts for now, freezing and multiple ways of preserving for later…..compots, jams, chutneys, pickles, curds, vinegars, favoured gins or vodkas, fruit jellies and cheeses, cordials, wines and ales, ketchups and sauces. Almost too may choices. Be sure you are allowed to forage from the lane/park/open space you choose; land maybe protected or private, foraging isn’t just a free for all. Don’t strip plants bare, leave fruit for others and for the wildlife. Make sure you know what you have collected before using it as food. Only collect from areas where you are happy there won’t be contamination, so right next to a busy road might not be great. Always be considerate and sensible about where and how you forage. The are some good books on foraging to help you know what you might find where and when and also for identification. Three that I particularly like are Food for Free by Richard Mabey (it comes is a tiny pocket size so is easy to carry with you); The Foragers Handbook by Miles Irving more a research book for at home, Miles also runs foraging courses (as do others); and the River Cottage Hedgerow Handbook by John Wright. Most of what you’ll collect over the next two months will be fruits and berries of some description, but there could be end of season vegetables too from the garden. There’s mushrooms to be had of course but that’s a whole other topic. To decide what to do with whatever glut you have think about the following: how ripe is the fruit, how sweet or tart is it, how long is the season (is this the last for this year or might you be able to collect more), how much do you have? All of these things will influence what you might choose to do. If you have a small amount of ripe fruit then if its edible uncooked you’ll probably want to eat it as is with cream or yoghurt or perhaps made into a cake, pudding, tart or crumble. If you’ve a lot of something then you’ll need to preserve some for later use either as a jam, jelly, chutney, pickle or something. I tend to make pickles, chutneys and fruit vodkas because they are what I like but think of what is most likely to get eaten up before next years glut and also what people you know will appreciate as presents. If the fruit is less ripe then pickles and chutneys are a good choice as the sourness is part of the taste and can be balanced by the spices and sugar. Very under ripe fruit can be made into Indian style pickles (a bit like lime pickle), I’ve tried this with plums and green tomatoes and it works well with both. There really are so many choices it’s hard to single out one recipe (but I’ve included lots of links this month for you). Good resources are River Cottage Preserves Handbook by Pam Corbin and The Jam, Preserves and Chutneys Handbook by Marguerite Patten. Both are excellent on basic techniques with plenty of recipes to try. Do remember that if you are making chutney or pickles then you need a non-reactive pan (i.e. not aluminium) and inevitably the vinegar evaporates so have the extractor on and close the kitchen door, the taste though, is worth it. One thing I’m determined to try this year is drying fruit. I love the dried berries and apples in granola and muesli so I’m going to make my own. I’ll be following this method from a curious little book called They Can’t Ration These, written during WW2 by Vitcome de Maudit (and republished by Persephone) its fully of quirky ideas for foraging and cooking. Use only sound, unbruised fruit, wash, clean and drain the berries on wooden or iron sheets and place them in a very moderate oven (110F). Raise the heat gradually to 130F, then when the berries fail to stain the hand when pressed but are not so hard that they will rattle, take them out and store. The length of time for the drying varies with the kind of berries, but it is from 4 to 6 hours. This article was first published as part of the series I write for Francoise Murat & Associates newsletter. If you want to get the article sooner then why not subscribe to the newsletter which also has features on gardening (including kitchen gardens) and interior design. Its very nearly the end of the the elderflowers for this year, in fact in some parts of the country I’m sure they are already gone gone gone. 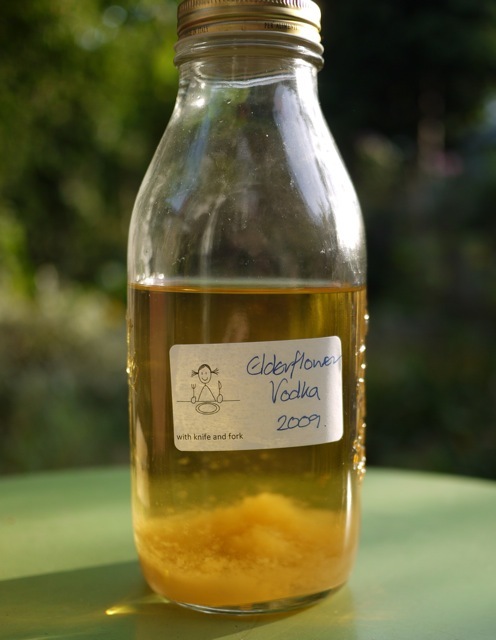 But in a few places there are still some good ones to be found so if you are quick you might be able to grab a few flower heads and make cordial, champagne or…guess what……yes flavoured vodka. Make sure there are no bugs on the elderflowers. Put the sugar then the flower heads in the jar or pan. Pour over the vodka. I don’t use citric acid like you are supposed to in the cordial because I don’t think you need it here. Stir or shake if the jar has a good seal regularly to help the sugar dissolve. Strain either just with a sieve (so expect a bit of debris) or through muslin/coffee filter for a clearer result. Leave to mature for at least 4 weeks or longer, the longer you leave it the mellower it gets but as elderflower is delicate you don’t want to leave it for ages, sloes and damsons can mature for a couple of years and get better but this would lose its flavour. Drink straight. Use as a mixer like you would cassis. Or give it as gifts if you make loads. This article was first published in Francoise Murat & Associates newsletter in March 2010. Mention cheese and onion and most people think of crisps. My quick Twitter survey revealed answers naming the Walkers brand, the colour of their bags (blue apparently) and even Gary Linekar, the face of Walkers crisps for so long he must surely have earned more from promoting crisps than from playing football and being a pundit. A few people were more inventive suggesting pasties and toasties but for most it was all about the crisps. The reason the crisp flavour works well is that the milky sour tang of cheese and the pungency of alliums are happy bedfellows, which means they have lots to offer in the kitchen, and spring is when plenty of both are at their best, real cheeses and real alliums, not Walkers crisps. Thinking about the combination a whole host of dishes come to mind: leek and cheese sauce for pasta or chicken, onion soup with a lovely melting cheese crouton, cheese with pickled onions, cheese and onion marmalade sandwich, fresh goats cheese with chives, Yarg cheese wrapped in wild garlic, omelettes, frittatas or flans in a variety of allium and cheese combinations. The possibilities are endless. British grown alliums are at their best now, lovely slim tender delicate leeks, new season spring onions, regular onions, shallots and of course wild garlic. 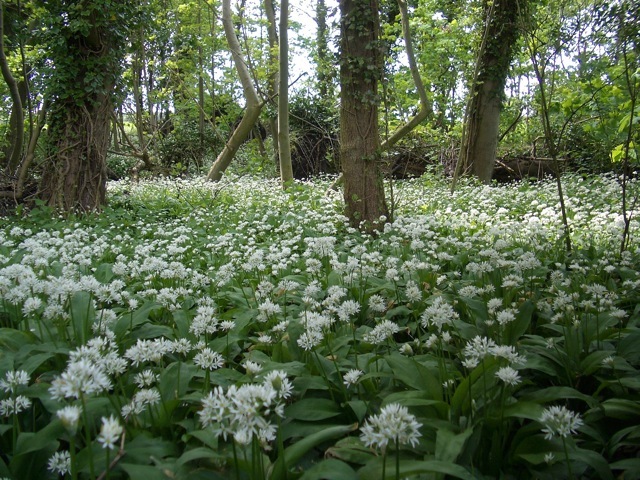 Wild garlic has become an ‘on trend’ ingredient in the last couple of years as foraging has grown in popularity. It’s easy to find (the smell is a giveaway) particularly in woods by streams, you can grow it in your garden in a shady spot (but beware of it taking over) and you might see it at farmers’ markets or farm shops. You can eat the leaves and the flowers but like any allium it can range from mild to blow your head off in strength so always taste a little first before deciding how to use it. If you go foraging make sure you aren’t on private land or ask permission first, don’t collect from close to busy roads and be sure you know what it is you’ve picked. Don’t dig it up, leave enough for others to have some and for the plant to survive next year. The flowers are pretty sprinkled on salads and the leaves make a good substitute for leeks or spring onions. As for cheese, fresh cheeses are particularly tasty in the spring as herds start to feed on grass again enriching the milk with clean herby flavours. Britain has a wealth of artisan cheeses and you should be able to find at least at one or two fresh cheeses in delis and farm shops. 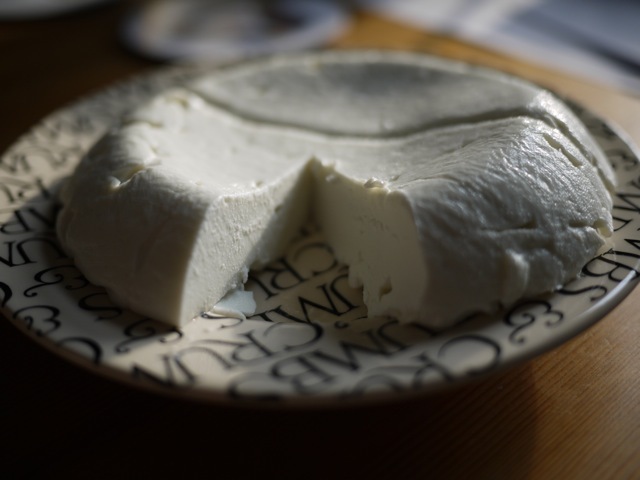 If you can’t then why not do a little experimenting in the kitchen and try making your own curd style cheese. It’s very simple to do and works with all types of fresh milk: cow’s, goat, sheep, even buffalo. Unpasteurised milk is lovely but normal works fine. This method is quick and easy and good as a supervised experiment for children. The yield varies depending on the milk, its highest with buffalo and lower with cow’s milk but whatever you choose you’ll get a lovely fresh delicious cheese. You can use the leftover whey in bread making in place of some of the milk or water. Adapted from a recipe in the Casa Moro Cookbook by Sam & Sam Clark. Warm the milk to between 32-37C. Pour into a bowl and cover with cling film. Leave in a warm place for 30-45 minutes. The curds will have set so cut them into about 3cm cubes whilst still in the bowl. Be gentle. Leave for a further hour in a warm place. Strain the curds into a muslin-lined colander. Leave for about 6 hours for the whey to drain. It’s as simple as that. The cheese will keep for up to a week in the fridge. It’s very mild in flavour and is particularly good rolled in some finely chopped wild garlic leaves or other fresh herbs. It also works well in omelettes, flans, and frittatas and stirred into pasta, with alliums of course and maybe a little mustard. So next time you think of cheese and onion go beyond the immediate thought of a crisp flavour and branch out a bit in the kitchen. Last weekend the twitter wires were buzzing with foodies claiming to have found superbly ripe blackberries in and around London. Seemed a little early to me but people were twitpic-ing them and they looked good. I was still doubtful but thought I’d take a chance and see what I could find. We found loads and loads and loads and loads of bramble bushes and plenty of smallish under ripe blackberries. No big fat juicy ones as other claimed to have found. I was beginning to think perhaps they were all having me on and had been foraging at their local supermarket….. I wasn’t prepared to give up – I had empty bags to fill so after a bit more searching we settled on a spot and started to pick the best we could find moving on bit by bit to take the ripest ones and leaves the others for another day. We eventually collected about 1.5lbs – not a lot but I think another week or so and there will be a much better haul. We only saw one other person collecting and the bushes didn’t look like someone else had got there first and baggged all the plumpest ones. We did see plenty of people soaking up the sun, having picnics and larking about on the boating lake but no one was interested in blackberries. Put the blackberries in a pan and add the water, bring to a simmer and cook for 15 minutes until they form a puree. Rub through a sieve (preferably nylon) so you get as much of the juice and fruit as you can but no pips. Measure the volume of juicy pipless puree you now have. I got 350ml. For each 200ml of puree you need 1 large egg or 2 yolks, 150g of sugar (caster) and 40g of unsalted butter (plus maybe more see later). So I used 70g of butter, 2 medium eggs, and 260g of sugar as the nearest sensible equivalents. Put the puree sugar and butter in a heatproof bowl and warm it over a pan of hot water, stirring until it melts/dissolves. Beat the eggs thoroughly and then add them to the blackberry mix, keep stirring over the hot water until it all thickens and coats the back of a spoon like a good cheese sauce would i.e. still a bit runny as it will thicken as it cools. Mine seemed a bit runny do I added about another 10/15g of butter (I didn’t weigh it I just added small pieces until I got the desired effect). Then pout into hot stertilsed jars trying to avoid getting it all down the jars and on the work surface like I did (new narrower jam funnel needed for me I think). 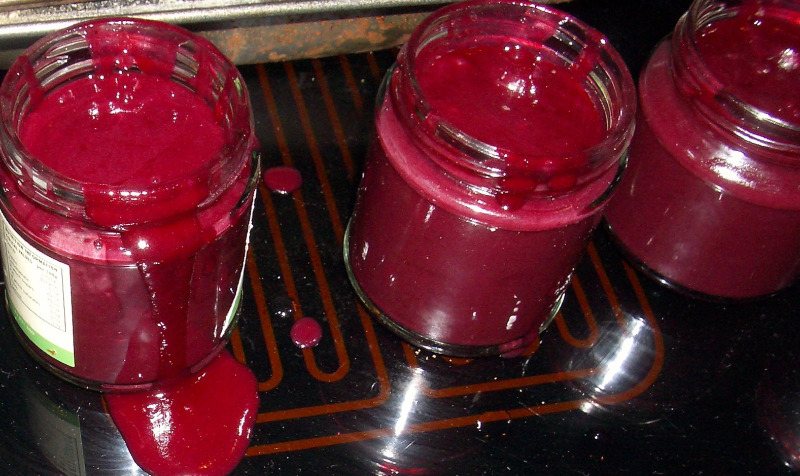 Lids on jars and leave to cool before storing in the fridge. Remember to lick the spoon thoroughly and barter hard with anyone who tries to blag a jar because it tastes really good.